Trenton Peacock watches a drive attempt during a June 25 match at Meigs County Golf Course in Pomeroy, Ohio. 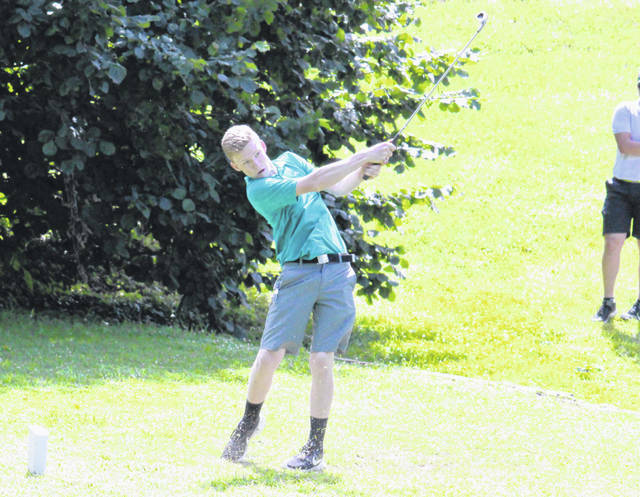 Evan Pope watches a putt attempt during a June 25 match at Meigs County Golf Course in Pomeroy, Ohio. POMEROY, Ohio — A perfect day to play golf. 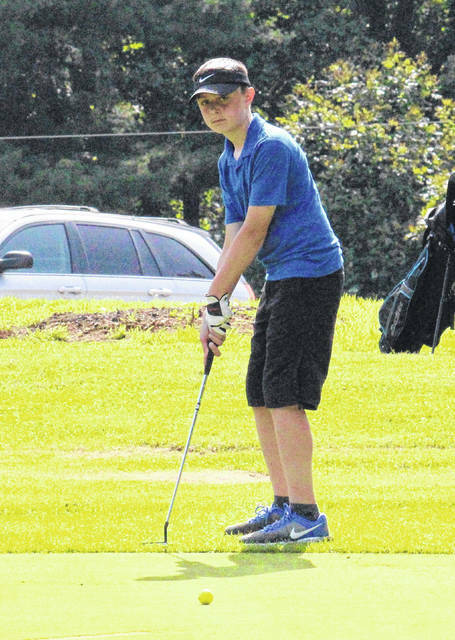 Not only was it a beautiful day, but the 38 golfers taking part in the Frank Capehart Tri County Junior Golf League on Monday added some excellent efforts at Meigs County Golf Course. Only two of the age groups were not playing for championships. The boys division in the 10-and-under age group was won today by Mason Morris who shot a fine 40 for the day. This gave Mason 10 points for the day giving him a total of 24 for the season. Second place today went to Grant Roush who posted a score of 41. Grant’s total points came to 28 for the year. Alec Conway finished third today with his score of 45. However, today’s score gave Alec six points and a point total of 30 for the year and the league championship in this group. Riley Cotterill, Timmy Russell, Blake Fackler and Jeff Lyle also played in this age group. The young ladies in this group were led today by Teagan Conway with a score of 59. Kyrstin Fackler was second with her score of 64. Both of these ladies tied with point totals of 18 apiece. However, Ali Norris, who did not participate today because of illness, won the championship plaque with a total of 28 points. The 11-12 year old age group was deadlocked going into today’s action. Joe Milhoan and Caleb Pierson both had 27 points. Joe had a good day shooting a 48 for the day which won him the 10 points and the championship plaque. Cole Miller shot a 50 today giving him the second place trophy. Evan Pope’s score of 52 today gave him third place. Caleb’s score of 57 placed him fourth today, and Evan Roberts finished fifth. Marlo Norris won both the championship plaque and the first place trophy with her score of 62 for the day. Marlo was the only player in this group today. The 13-14 boys division was another close competition with only two points being the difference between winning the championship plaque and second place. Today’s winning score was shot by Ethan Short with his 47 strokes. Brennan Sang shot 51 today giving him the second place trophy. His point total for the season was 26. However, Landon Atha was third today, but his yearly point total of 28 won him the championship plaque. Zack King and Ethan Marcum also played today and were competitive in the point race. Caitlin Cotterill won the first place trophy today as well as winning the point race giving her the championship plaque for the ladies in this age group. . The 15-17 year old age group was very competitive in both the boys and ladies divisions. Whitney Byrd won both the first place trophy and the championship plaque shooting an excellent score of 35 today. Byrd and Wyatt Nicholson were tied going into today’s tournament. The point total for both young men was 23. Wyatt shot a very good score of 38 today, but it only gave him the second place trophy as well as finishing second in the point race by a mere 2 points. Evan Harbour score of 40 gave him the third place score for the day. Fourth place went to Jarrett Hupp with his score of 40. Trenton Peacock was fifth today, with Gus Kennedy and Issac Roush following behind. Kylee Tolliver shot 44 to claim first place in the 15-17 girls division. Haley Pierson was second today with a score of 46, while Mikayla Radcliff was third with her 47. Pierson won the championship plaque with a point total of 28. Six young men took part in the 18-19 year old boys division. The scoring for the first place trophy was about as close as it can be with a tie for first place. Douglas Workman and Bryce Tayengco both shot very good scores of 39. Levi Chapman had two bad holes and finished third with a 41. Bryce Swatzel, Theo McElroy and Jonah Hoback also played in this group. It was Jonah’s first appearance of the season. Workman’s point total of 36 just did edge Levi Chapman’s total of 33 for the championship plaque. Kaytlyn Hawk shot her best score of the year turning in a 45 for the day. That gives Kaytlyn both the first place trophy and the championship plaque. The final tournament for the year will be held Monday, July 16, at the Riverside Golf Course in Mason County. Registration will begin at 8:30 a.m. with play starting at 9 a.m. Plaques for all the age group winners will be distributed as well as trophies for last week’s winners. Th 2018 season finale is considered a ‘Fun Day’ and all players will be assigned a handicap based on their previous scores. A net score will then be posted with all age (male and female) groups competing against one another. The participants, based on their final score, will then have the opportunity to choose various prizes. The prizes will include, among other things, golf balls, towels, hats, tees and several other golf related items. As usual, a small lunch will be served at the conclusion of play. The directors of the league are requesting that the parents, grandparents, and other interested parties of the players bring a dessert to be served along with lunch. This can be cookies, cakes or other items that would be appreciated by the youngsters. Of course, chips and soft drinks are always welcome. For more information, contact Jan Haddox at 304-675-3388, Jeff Slone at 740-256-6160, or Bob Blessing at 304-675-6135.